Foresite (a global service provider) delivers an array of managed consulting and security solutions to help their clients meet compliance and information security initiatives. These solutions let organizations proactively identify as well as respond to cyber-attacks and breaches where they occur, and remediate them. Enterprises generate millions of log alerts every day. Foresite helps rule out that noise and determine what data is meaningful providing you with actionable information that will help you respond and protect against damaging security threats. Organizations like yours continue to fight an asymmetric battle against cyber attackers. These attackers are well-funded, sophisticated and well-organized. They use techniques that are highly targeted and which leave technology-only security strategies exposed. To stop them, you need to understand them - how they work and think, and what they want. Software that's outdated and devices that are unmanaged can leave your staff, organization and yourself wide open to cyber threats. 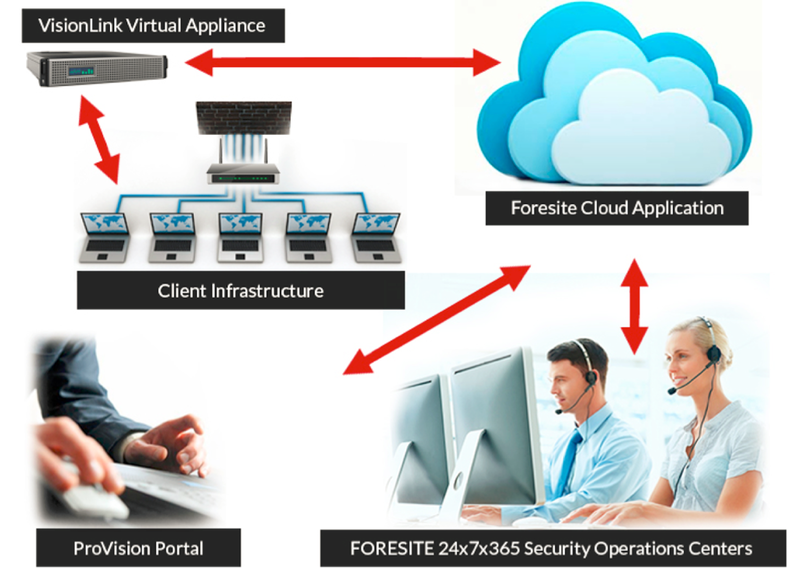 Foresite can help you manage your organization's security infrastructure and also protect your critical assets so you can leverage their technology investments sooner and longer. Foresite's proprietary management platform is cutting-edge, and will put you in your business's driver’s seat for business security and data operations. It's designed to meet today's moste stringent industry standards all with ease of use and flexibility that is unmatched. Foresite's experience and education differentiate us from their competition. It's vital that, as technology evolves - that businesses in this industry work harder and harder to stay informed and keep ahead of the inevitable curve. Foresite That’s why we do our best to earn each and every certification relevant to our field of business - as well as yours. Below is a list of our various certifications and credentials. Organizations like yours are under the constant threat of cyber attack. These continuously evolving attacks get more sophisticated and persistent. Then, as an organization's technology needs keep increasing, your potential vulnerabilities and entry points can also increase. To deal with such persistent threats, organizations must implement the most advanced security testing policies. Waiting until an attack has begun can mean the difference between a huge crisis vs a small issue. Impersonation Attack: In this case, the badguy will make use of information about your staff which is publicly available. They will impersonate someone like a repairman, vendor, manager, trusted third party to get their hands on physical / digital access to a specific facility. Spear Phishing: These emails are specifically designed to fool your employees into performing some type of action - typically clicking on a particular link or opening an attachment. It usually ends by getting them to expose some of their credentials - or perhaps enabling remote control of their machines. Media Drop: Some type of disposable media, like a USB stick or CD is made by the badguy. They "drop" them in carefully chosen areas in a way to entice your employees to pick them up - curious about what they might contain. Perhaps even labelled "money" or "accounts" etc. If your staff insert them into one of your machines, it triggers a notification or compromise of some kind. It's easy to find data compliance confusing? So many acronyms for various types of data, industries, and required methods of storage make regulations difficult form someone without technical expertise to interpret. Foresite makes these complicated compliance issues easy for non-technical executives to understand. You'll be walked through your current compliance operations and get suggestions for improvement. Many organizations partner with third-party vendors as an essential part of their business. It lets them to keep their costs down, reach larger segments of their market and focus on core areas of theie business. However, are you aware of the risks that those relationships could possibly expose your organization to? Risk assessments. When you work with a particular vendor - how much risk are you exposing yourself to? Foresite will work with them to determing the level of risk and what mitigation steps need to be taken. Security assessments: Perhaps your potential partner has some serious holes in their data security strategy? Foresite will assess their operations and find out whether they are a good fit for your business in addition to making recommendations on how they can be brought up to speed. OCIE cybersecurity initiatives reviews: Foresite will conduct a full review of your partner's operations and will compare them to OCIE cybersecurity initiatives. 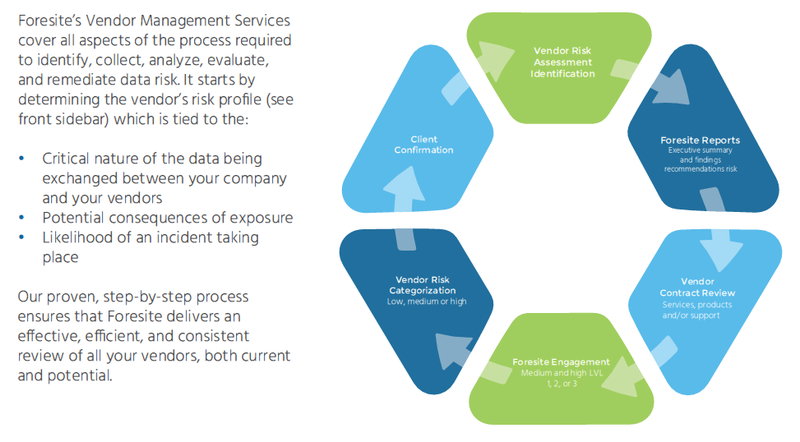 That outlines proper data loss prevention, access rights and vendor management practices. NIST SP800 guideline assessment: Requirements for developing federal information systems are outlined in the NIST SP800. The NIST SP800 is the industry standard for security planning - and regardless of whether or not you are - Foresite uses as a guideline when conducting your security assessment. Our specialists are expert in designing cyber security solutions and can help you create a plan for sourcing and deploying your Foresite solution. Optrics offers personalized Foresite product training by senior experts - a service designed to help you integrate your Foresite solution smoothly into your organization's compliance plan.